Another picture of Plains Cupid shot on August 15. 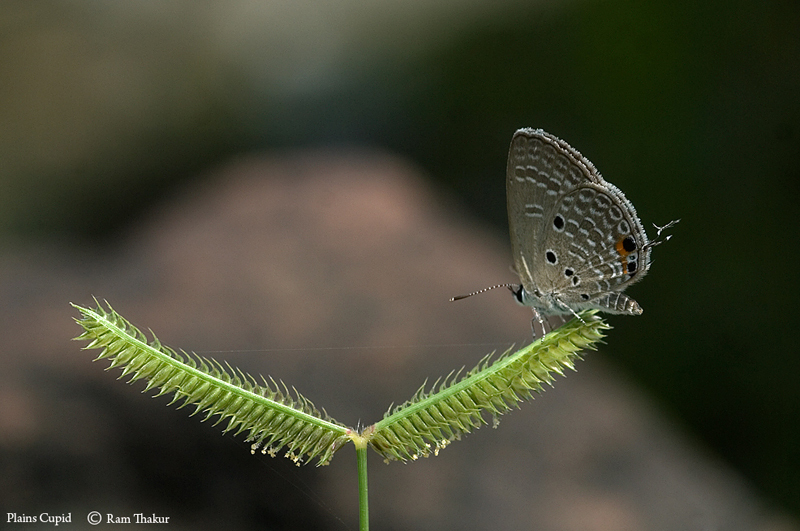 Chilades pandava, the plains Cupid or cycad blue, is a species of lycaenid butterfly found in India, Sri Lanka, Myanmar, United Arab Emirates, Indochina, Peninsular Malaysia, Singapore, Taiwan, Java, Sumatra and the Philippines. They are among the few butterflies that breed on plants of the cycad class. this shot is very pretty, I love the cute little Butterfly very much. Good sharpness and a nice blurred background. I like the composition with the cute plant, which makes a nice couple with the butterfly. une magnifique photo: position du papillon sur ces herbes symétriques et fond neutre très agréable. Very well shown this cute Lycaenid posed like an Circus artist on the plant.